2T - $24.99 3T - $24.99 4T - $24.99 Size 5 - $24.99 Size 6 - $24.99 Only 4 left! The Force might be mighty powerful, but it can't do everything for you, even if you are an intimidating Sith Lord like Darth Vader. You may be able to use it to help you win a lightsaber battle against Obi-Wan Kenobi, but it's not going to keep you dry during a Kamino style rainstorm! When that happens, all the Dark Side powers in the world won't help a Sith from catching, but this Darth Vader raincoat will! 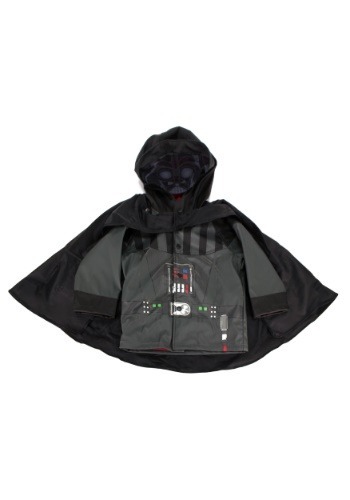 This Star Wars raincoat is a kid-sized coat that will keep your little one dry while he practices his Dark Side powers! The coat is made of a water resistant material which has Darth Vader's armor on printed on the front. The hood even has a face mask that resembles Vader's signature helmet. And Darth Vader just wouldn't be Vader without his signature cape, right? This raincoat has an attached cape that gives your child an ominous appearance while helping him stay dry! Your little one will be all ready to jump in puddles around Kamino once he has it on! My son loves it!! He slept in it for first 3 days. I was impressed with the quality.